If you recently have had laminate wooden floors installed, you are probably curious what is the best maintenance and care you can provide to ensure the condition remains in good standing and your investment lasts. We at Leading Carpet Cleaning would to share the guide on how to care, maintain, and treat your laminate hardwood floors. First things first, removing dirt and debris from floors is important not just for the overall indoor health quality, but grit and traction can cause damage to the laminate flooring too. A microfiber mop is the first thing you need to clean the floors. Gliding across the floor to pick up dirt and pet hair effortlessly, the microfiber mop is equipped with a swivel head to cover large areas quickly and go under and around furniture simple. Laminate wood floors need to avoid contact with liquids and require very little as too much will cause the flooring to warp. In this regard, when it comes to sanitation or removing spots, you can use a premade manufacturer’s cleaning solution or make a homemade solution, which is a less expensive but equally efficient alternative. In a squirt bottle mix thoroughly together 3 parts water, 1 part white vinegar, and a small squirt of liquid dish detergent. 1) Thoroughly remove the dirt and debris with a microfiber mop, or if prefer, you can use a vacuum on the wood floors setting. Keep in mind when vacuuming or dust mopping the floor, it is best to follow the direction that the floor is laid in as it collects all the dirt between the grooves instead of trapping it. If you opt to use a vacuum, ensure the beater is not operating during vacuuming as it can damage the surface. 2) Lightly dampen the microfiber pad with warm water and spray on the cleaning solution, either the handmade solution or the manufacturer’s formula directly on the microfiber pad. 4) Mop the floor make sure to clean off the sides, corner, and middle of the floor. To avoid missing anywhere, use a grid-like pattern to ensure detail. 5) As the microfiber pad gets too dirty simply, simply rinse, replace and reapply the cleaning solution. 6) After you have completed the microfiber pad can be tossed in the washing machine for cleaning after you have rinsed off the bulk of the residues. –	Never wax or polish your laminate flooring as it is not true wood and does not need it. –	Avoid using anything with chemicals that promise a clean and shine. –	For cleaning laminate floors, do not use bleach or abrasive cleaners. –	Because they are infamous for scratching surfaces, never use steel wool or scouring pads. –	Resist using string mops or sponge mops that use a lot of water. –	Never soak the microfiber mop pad, but only dampen it when wet mopping your floor. –	Use dry cloth or paper towel to blot up spills. Do not allow liquids to linger as moisture will cause damage and warping. When it comes to professional assistance when treating your hardwood floors, contact the pros of Leading Carpet Cleaning and let our experts do the rest. Tile & Grout Cleaning FAQ in Orange, CA; How Often to Seal Floors, Shower Walls etc? When it comes to the overall care of your tile and grout, no doubt you have a few questions, particularly when it comes to professional tile and grout services. When giving your tile routine cleaning, you have to keep in mind to keep it in optimal condition not only for the aesthetics but the longevity as well and only with professional services can ensure it. Much like carpet, the grout in particular, being porous in nature absorbs soils and moisture and even with diligent cleaning efforts, over time the grout will look dingy and the tile dull. Today, we at Leading Carpet Cleaning have compiled a frequently asked question list concerning professional tile care and answered the most common among them. Q: How is professional tile and grout cleaning done? Using cleaning agents specially formulated for tile and grout to remove layers of dirt, debris, and accumulated residues of soap scum and mineral deposits, as well as any microbes and bacteria that often lead to mildew and mold along with state-of-the-art high powered quality extracting machines, the filth below the surface is pulled to leave tile and grout clean, sanitized, and deodorized. Q: What is the recommended frequency of professional tile and grout cleaning? It depends on the contributing factors such as the foot traffic volume, how many people and pets traverse the floor, how diligent owner maintenance, exposure to moisture, and so on. Typically, tile and grout need cleaning every 6-12 months with annual sealant applications. Q: How long does it take professionals to perform a tile and grout cleaner and/or sealing? The average size room, up to 250 square feet, generally take anywhere from 45-90 minutes to clean, depending on the circumstances. The amount of buildup, size of the tile, room configuration, grout lines, and so on play a role in how long it takes the professional and if the tile and grout is in need of sealant, it can take up to 3 hours for the completion. Q: Is a tile and grout professionally cleaning really necessary? 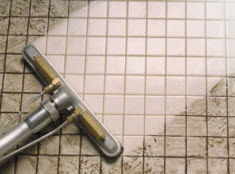 Similar to carpets, the dirt and debris collects over time and even with routine cleaning, you can’t extract it all; being the grout is porous in nature, especially so if the sealant has dissipated, and the tile is scratched and etched, it takes the powerful equipment to effectively remove the filth. Q: Why is sealing important for tile and grout? Because grout is a porous material that absorbs soil and moisture a barrier needs to put applied, which is the sealant. With the protective coating, your tile and grout can resist absorbing spills and tracked in dirt and debris, giving you ample time to remove the majority of it before a massive volume settles. Q: How soon after a cleaning/sealing service can people walk on the tile. We encourage homeowners to wait at least 3 hours before walking on it and 24 hours before allowing any liquids to make contact as it takes 24 hours for the sealant to cure. Q: Should I use a specific cleaner following sealant service? If you want to extend the sealant as far as possible, avoid using any harsh abrasive and acid cleaners, particularly bleach and other such cleaners. When mopping the floor simply use a small quantity of liquid dish detergent and water to avoid breaking down the sealant. When it comes time for your tile and grout to be cleaned by an expert, call Leading Carpet Cleaning today and let our specialists revitalize your tile and grout. There are many benefits to choosing tile flooring for your home. Not only are they available in all shapes and sizes, but you have several color choices to choose from as well. No matter what design you have in your home, you can find a tile floor that will compliment it. The durability of tile flooring is another obvious choice. Just like any flooring choice, you need to properly clean it to extend its life and fully enjoy it. Leading Carpet Cleaning is here to share some cleaning and maintenance tips for your tile flooring. Depending on the tiles you choose for your floors, you may notice they are dirty quickly. Don’t wait until they are noticeably dirty before you do something about it. Sweeping your tile floor daily will keep dirt, debris and food from damaging your tiles. As you consider mopping, use just plain water and you will see that the shine on your tile flooring will be bright. You don’t need fancy cleaner for everyday cleaning; warm water and a mop will do the trick. Just make sure you dry it right after you mop. When you leave your tile floor wet waiting for it to dry, dirt and dust will settle into the moisture and your floors will look dirty right after cleaning them. From time to time, you will need to use cleaners on your tile flooring. A mixture of ½ cup vinegar and 1 gallon of warm water work as a great degreaser. Warm water and dish detergent are another great choice for getting the grime off your flooring. When you have a stubborn stain on your tile that you aren’t able to remove with the other cleaners, you can use scouring powder to remove them. Mixing half scouring powder and half water to use on a stubborn stain works wonders when you use a soft bristled brush to scrub away. The grout on your tile flooring is often forgotten. There are several commercial cleaners out there that claim to do the job, but you may have all you need to clean them in your kitchen already. A mixture of baking soda and a little water make an excellent paste for cleaning your grout. Cover problem areas with this paste and let it stand for a couple hours or even overnight. Using an old toothbrush, gently scrub the stain. Then you can remove any extra paste with warm water. Caring for your tile and grout is important. Homeowners will do much of the maintenance as they enjoy the day to day. Just like carpet, getting your tile and grout cleaned professionally twice a year will remove dirt and debris that are hard to get rid of on your own. Leading Carpet Cleaning offers not only carpet cleaning, but tile and grout cleaning as well. You would be surprised at how much a professional tile and grout cleaning can make a difference in the look of your tile flooring. Call us today! The carpets in your home should not be neglected. They need to be maintained throughout the year, not just when they are visibly dirty or your in-laws are visiting. There are many reason it’s important to do so. 1. Regular carpet cleaning prolongs the life of your carpeting. The extraction method can increase the life of your carpet a great deal and will protect the investment you’ve made in your floor-covering. 2. The quality of the air in your home will be improved with regular carpet cleaning. Carpet can trap airborne pollutants. These pollutants need to be removed in order to protect your carpets and maintain the indoor air quality of your home. 3. 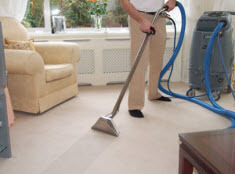 Carpets that are cleaned regularly are easier to maintain. 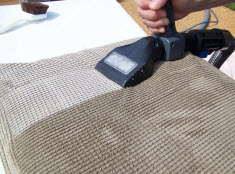 Dry soils are what make up most of carpet soiling and when carpets are taken care of the right way dry soils are more easily removed with a regular vacuuming routine. 4. Remove spots and stains promptly so they don’t attract more soiling. This also protects your carpets from further damage. 5. Allergens and bacteria can’t buildup if carpets are taken care of. Moist soiling on your carpets result in these and other unhealthy contaminants. 6. Dirty carpets can make a room look bad. Quickly enhance the appearance of any room with a cleaning. Clean, well-maintained carpets say a lot about the overall cleanliness of your home. 7. If the regular cleaning of carpets is being done in the workplace then it will improve worker morale. It’s easier for workers to be productive and feel better about their work when they’re working in a clean environment. 8. Well-maintained carpets just make carpets look and feel clean and fresh. 9. Carpets can be home to dust mites and bedbugs. Carpets that are cleaned professionally can remove pests. 10. Carpets come with warranties and many times these warranties require your carpets to be cleaned using the extraction method within a specific amount of time. Every 12 to 18 months is the norm. What Are Hot Water Extraction Carpet Cleaning Machines? The hot water extraction (HWE) method, is a method used in chemistry for extraction and for “steam cleaning”. The pressurized hot water extraction process uses a combination of high water pressure for agitation and hot water to increase reaction rate. Hot water extraction provides a through, deeper clean. How does it work? First, a powerful machine heats water in a cleaning tank. Professionals will use a hot water extraction cleaning machine to inject water and a cleaning solution into the carpet and remove the dirt. Then the machine will extract the solution and the hot water back out of the carpet along with all the dirt so it can dry quickly. You can see visible steam from the hot water but it’s the water that is doing the cleaning, not the steam. Is hot water extraction different than steam cleaning? Steam is hotter than hot water. To get steam, the water must boil and evaporate into steam. Stains can become set in with steam and if a cleaning agent like detergent is being used, steam can’t provide as thorough a rinse as using hot water provides. The hot water completely flushes the carpet fibers and removes dirt. For many reasons, it’s a good idea to make professional carpet cleaning throughout the year a priority. Contact Leading Carpet Cleaning today to set up a schedule.